Great Britain will compete in tennis' Davis Cup World Group for the first time in five years, meaning they're among the top 16 nations in the world. The elite World Group sees the top 16 national teams from around the world battle it out for a place in the final. GB haven't qualified for the annual elite tennis competition since 2008. 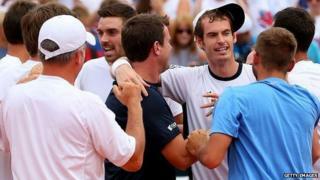 But thanks to the efforts of players like Andy Murray, Dan Evans and James Ward the team will take part in the 2014 tournament. They beat Croatia 4-1 in the play-offs to secure their place. Britain will now compete in the first round of the World Group in February 2014. A draw will take place on Wednesday 18 September 2013 to decide who they'll play first.